Toyota's segment-leading CUV 2013 Toyota RAV4 is all new in 2013. TN spotlights the changes you need to know about. The 2013 Toyota RAV4 will be an all-new vehicle, which combines the best elements of the past 16 years of models, and will correct some major flaws. Going forward the RAV4 will be optimized to fit the segment. That means 5 seats, a four cylinder engine, and exactly the right size for the Cute Utility Vehicle market (also called the Compact utility vehicle (CUV). Although compact, the RAV-4 is not really small. In fact, it is about the same size as the prior generation Toyota Highlander (which was made in that size up until 2007). Configured as a 5 passenger, with a fuel efficient, proven four cylinder engine, the RAV4 is being built by Toyota to serve the 90th percentile, meaning what 9 out of 10 RAV-4 owners wanted when they bought one in the past. The other shoppers needed the extra 2 jump seats and wanted the six cylinder engine. The RAV-4 is an extremely important vehicle for Toyota. Currently making up about half of the “truck” sales in the Toyota line-up, it is a wild success selling about 11,000 units per month. The new design will likely grow that. The new 2013 RAV4 will have only one drivetrain. It will use the company’s proven 2.5 liter four cylinder engine that will produce 174 horsepower. This engine is competitive in the class, and we have driven it in the Camry and other vehicles. It is smooth and well balanced, but it is not a strong engine for towing or for spirited driving. That said, is the RAV4 a spirited driving vehicle? Not for the vast majority of owners. The great news for future owners is that Toyota has not decided on a constantly variable transmission(CVT), like the Subaru Forester for example. Thank goodness. CVTs are the bane of any enthusiast and contribute little to fuel economy when compared to a well-designed six-speed automatic, which is exactly what the RAV4 will have. Like the prior generation Highlander, the RAV4 will have the first two gears designed for good grunt off the line. This makes the vehicle feel sporty and robust from stop light to stop light and when starting off. In normal driving the transmission then kicks up to a higher gear to save fuel anyway. Toyota has left the top two gears (not just one) for cruising fuel economy. The transmission can even blip the throttle to match revs on downshifts, something that even the Lexus IS350 sports sedan lacks. Toyota RAV4 also has a selectable drive mode, unusual in this class, but certainly welcome. Eco mode and sport mode are the two additional settings. In sport the AWD system helps out with more power to the rear wheels. The AWD system can also be “locked” to allow for a 50-50 rear front torque split for snow and light off road driving up to 25 mph. This type of automatic system reverts to normal AWD (which is front-wheel biased) on its own and is really all that anyone needs who drives vehicles like these. More off-road capability than this is really for vehicles like Toyota’s FJ Cruiser. The fuel economy of the new RAV4 when outfitted with All-wheel-drive is 22/29 mpg with the front drive version getting two more in each category. The new 2014 Subaru Forester is reported to do better, with up to 32 MPG highway in AWD configuration. We’ll see if that holds up when the EPA rates the Forester, but we will say that based on past drives and past Subaru specifications, the Forester is a vehicle that feels slow and is. Mazda's CX-5 with AWD can also achieve 32 highway, but again, feels slow. The Ford Escape and CRV do not feel slow when driven, but they get just one MPG better than the new RAV4 with AWD. Buyers should be careful not to believe the hype about the fuel economy of this class of vehicle. They should also make certain they are comparing apples to apples and not looking at a 2WD version, or manual shift vehicle. If fuel economy is paramount for the RAV-4 buyer an electric RAV-4 does exist and was rated by Torque News EV expert Nicolas Zart very highly. The new body of the 2013 Toyota RAV-4 improves upon an already handsome small sport utility look. The front may be the best in the business. The front is swept back in look, and the hood has a small frontal metallic area which will reduce stone chip damage. That concept is also in effect with the lower front bumper area which looks to be made of unpainted or robustly painted plastic. Just ahead of the real wheels this material also employed. These CUVs are great winter cars and Toyota is wise to help prevent winter road rash on the most vulnerable parts of the body. Looking front to back in the side view there is a strong character line high on the body just under the glass that becomes more pronounced towards the rear quarter. It works and makes the vehicle look smart and sharp. The side mirrors now have signals integrated which gives a premium look and are actually functional. On keyless Lexus vehicles those indicators illuminate as the driver approaches the car which is just plain cool. The rear of the vehicle has been fixed. It used to have a giant carbuncle of a spare tire mounted to a ridiculous side-swing tailgate. The spare is now compact and under the floor in the cargo area and the tailgate swings up and can be powered. This is how things should be in this class of vehicle, although a full size, matching spare like the Highlander comes with would have been nice. At least we don’t get the insulting tire repair kit found on so many new vehicles. Another improvement Toyota chose not to make was to hide the rear wiper up under the rear wing as in the Lexus RX350. Perhaps cost was an issue, but that design is the best in the business. The roof racks look sturdy, but also sleek. Not fully recessed, but also not in the way of the airstream or good looks. The interior of the new new RAV4 has grown up. Navigation is now found in most models and on dealer lots that will likely mean all models in stock. The center console was designed to accept your smart phone. That is because the Toyota Entune system is available and it can work with the smart phone for many apps. Movietickets.com, Bing, and other useful apps will work with Entune. 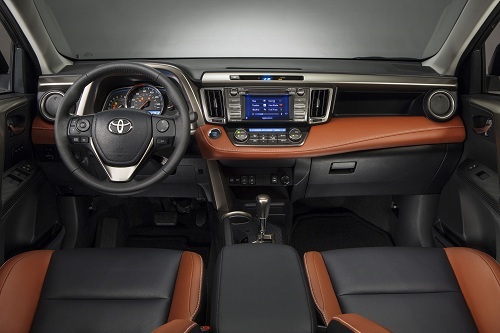 The RAV4’s interior design features French stitching on the seats and the dash. Top trims get SofTex material which is like leather, but more environmentally (and cow) friendly. The material is breathable for summer comfort, and the seats can be heated. Note the photo with this story is of the interior. That is how significant the change is. The 2013 RAV4 will have 8 airbags including knee airbags up front. Top trims can also get lane departure warning, which can thankfully be turned off. This type of system has its fans, but the IIHS has not yet found them to reduce accidents. Cross traffic alert is also available and anyone with any type of SUV will appreciate this. It helps one back up when parked between a brute ‘ute and a maxi-van and you cannot see to the sides in a busy parking lot. Unlike Honda, which sells its CRV as the Acura RDX, Toyota does not have a Lexus version of the RAV-4 for sale in the US. That is too bad, because with no changes this new RAV4 would be right at home in a Lexus dealer showroom. It is nearly as luxurious as the ES350 and it surpasses the level of refinement found in some Lexus CT 200h hatchbacks. With its side mirror illuminators, spankin’ new upholstery, and Entue system, Toyota RAV4 will wow buyers who see other brands' attempts at contemporary styling. Also, Toyota is kicking and taking this year, and recent years, in all of the major quality surveys. There is little doubt that this RAV-4 will be either the highest quality vehicle in its segment in the ratings of consumers, or it will be near the top. It will handily surpass the quality of many German rivals sold for much, much more money. The 2013 RAV4 will be available soon and will very likely bring more customers to Toyota’s already very popular dealer lots. Why no manual transmission? The all new 2013 Mazda CX-5 offers a 6 speed manual in addition to the usual automatics. And, YES, so glad Toyota opted not to go the constant velocity transmission. I detest automatics and hate the numbing CVT even more. I guess drivers in the USA prefer to be asleep at the wheel and cannot abide being involved with driving. Otherwise how to explain the lack of desire to move your right arm 8 inches and left foot 10 inches to shift a car? Well, since no one even bothers to signal a turn any more (a whopping movement of 3 inches by the left hand) I guess we are doomed one day to see manual shifters go bye bye.